indianaquariumhobbyist.com Forums » Post 337744 » Re: DIY 55W X 2 PLL Lighting fixture. Posted: Thu Oct 03, 2013 2:23 pm Post subject: DIY 55W X 2 PLL Lighting fixture. New diagram on Pg-4..
Well, Although this not exactly a complete DIY from scratch stuff.. If modification can be considerd as DIY then, that's what exactly I will be doing. First of all, I got this Old lighting fixture from Silent Auction - ASK meet 08-Sept-2013.. 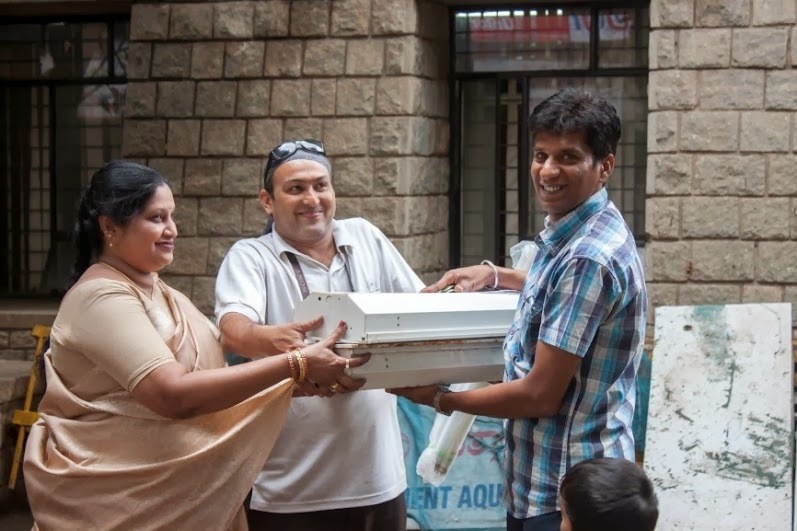 The Lighting fixture was put into auction by Vyas. Parts list as of now.. Will keep it updated as the work progress. 2. 2 Nos. 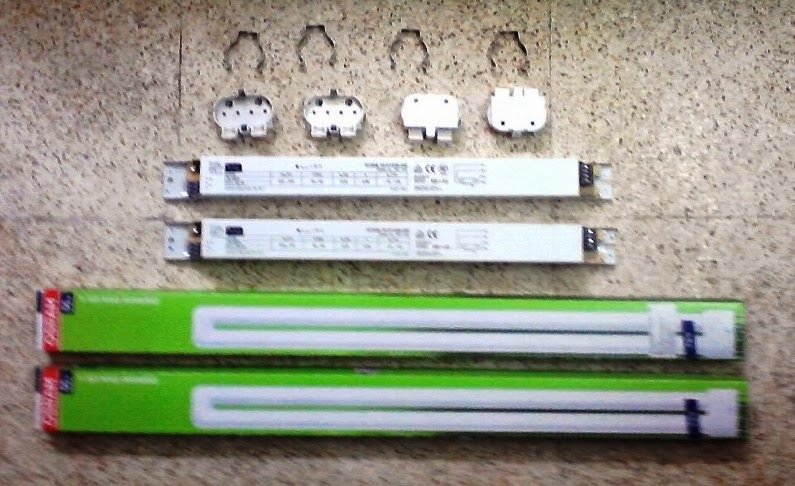 OSRAM DULUX L 55 W/865 2G11, Coolday light, 6500K. 4. 4 Nos. Bulb holders (2 extra in case of a problem). 5. 4 Nos. Supporting Clamps (2 extra). 7. 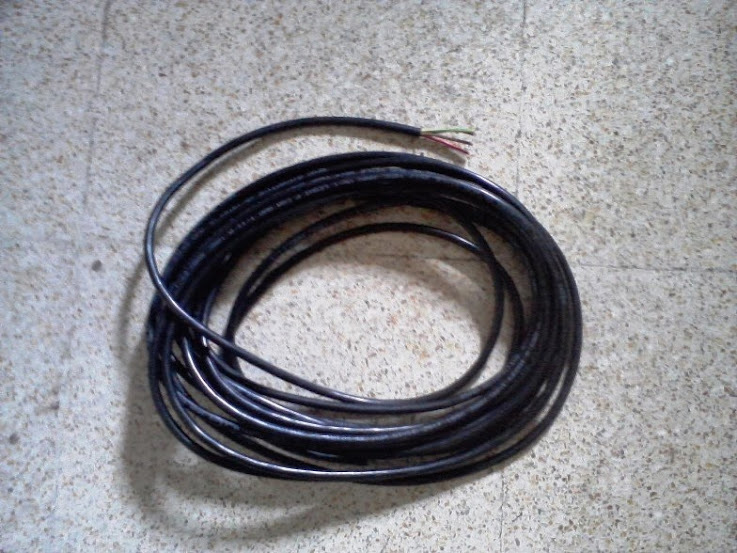 2 Mts of 4-core cable. 9. Plus the usual paint and related stuff. The Lighting fixtures were in good condition, it only needed a fresh coat of paint.. Thanks to coldfear39 (Abhilash) for the picture below.. It contained 2 set of 20W T12 bulbs with a Single Ballast which drove both the Bulbs. I just ripped all the things inside the fixture and worked on it with a few sheets of Emery paper (Sand paper) before painting.. Gave a coat of white paint on the inside.. But the out side paint job will be done at the end as the paint will be damaged while working on it.. 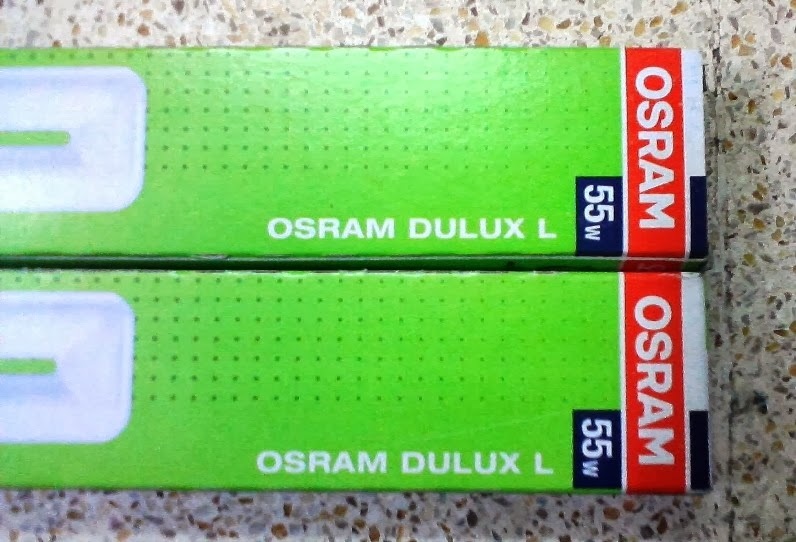 Went to B.V.K.Iyengar Road and bought these Bulbs and Accessories..
Osram Dulux L 55W PLL Bulbs 2 Nos Rated 865 - 6500K (Cool Daylight).. Which, I believe fits as though that this fixture was made for these bulbs..
And other things which I needed to fix and run these bulbs.. I bought those holder and clamps in excess of 2, Just In case..
And 2mts of 4-core cable which was lying around in the house..
Krishna Prasad gifted me with this beautiful reflector .. which is once again a perfect match for my project, it has all the cutout and holes needed to fix on the Lamp holder side. Although this is actually meant for a 4 footer Tube light fixture, my lighting fixture is only 2 feet. So, I will have to cut it in to two parts.. each bulbs will have their own separate reflector ..
That's it for now, will update as the work progress..
Posted: Thu Oct 03, 2013 5:18 pm Post subject: Re: DIY 55W X 2 PLL Lighting fixture. Posted: Thu Oct 03, 2013 5:27 pm Post subject: Re: DIY 55W X 2 PLL Lighting fixture. I intend to upgrade from 2X36W PLL to 2X55W will follow this thread in my existing wooden hood. Posted: Thu Oct 03, 2013 5:33 pm Post subject: Re: DIY 55W X 2 PLL Lighting fixture. Nidhi.... Do 36W and 55W PLL's need different blasters ? Posted: Thu Oct 03, 2013 5:48 pm Post subject: Re: DIY 55W X 2 PLL Lighting fixture. Yes Abhishek, they run on different chokes..
Posted: Thu Oct 03, 2013 6:17 pm Post subject: Re: DIY 55W X 2 PLL Lighting fixture. thank you very much nidhi, I didn't know 55w existed, I was planning in making a hood for my 3ft, is there any pll more than 55 w? Posted: Thu Oct 03, 2013 6:21 pm Post subject: Re: DIY 55W X 2 PLL Lighting fixture. I was waiting for this, Nidhi. It will be good to see this when finished. Posted: Thu Oct 03, 2013 6:58 pm Post subject: Re: DIY 55W X 2 PLL Lighting fixture. Posted: Thu Oct 03, 2013 7:03 pm Post subject: Re: DIY 55W X 2 PLL Lighting fixture. Congratulation. Very good DIY. All the Best. Nidhi. Posted: Thu Oct 03, 2013 7:23 pm Post subject: Re: DIY 55W X 2 PLL Lighting fixture. Posted: Thu Oct 03, 2013 7:35 pm Post subject: Re: DIY 55W X 2 PLL Lighting fixture. Posted: Thu Oct 03, 2013 7:39 pm Post subject: Re: DIY 55W X 2 PLL Lighting fixture. good one Nidhi!! waiting for the progress!! Posted: Fri Oct 04, 2013 11:55 am Post subject: Re: DIY 55W X 2 PLL Lighting fixture. Posted: Mon Oct 07, 2013 9:33 am Post subject: Re: DIY 55W X 2 PLL Lighting fixture. Was a bit busy , so was off line.. The 55w PLL are a bit longer than the 36W bulbs, so make sure you have the extra space needed to accommodate these bulbs.. They are like 535 mm in over all length, where as 36W is about 415 mm. The pleasure is mine Waseem. You get 80w PLL in Osram, but they don't come in coolday light (6500K). You get them in 3000K, 4000K and 8000K.. but 8000K wont be stocked by dealers in any wattage of what so ever, so forget that. Then too 80W PLL them self might be out of reach as they are not much of a moving item, so they might not stock the others as well. So good luck in finding them.. here is the link to the bulbs.. Yes, Black color Matt finish is a good choice, few others have suggested the same as well.. Thanks for the in put..
Posted: Mon Oct 07, 2013 12:04 pm Post subject: Re: DIY 55W X 2 PLL Lighting fixture.